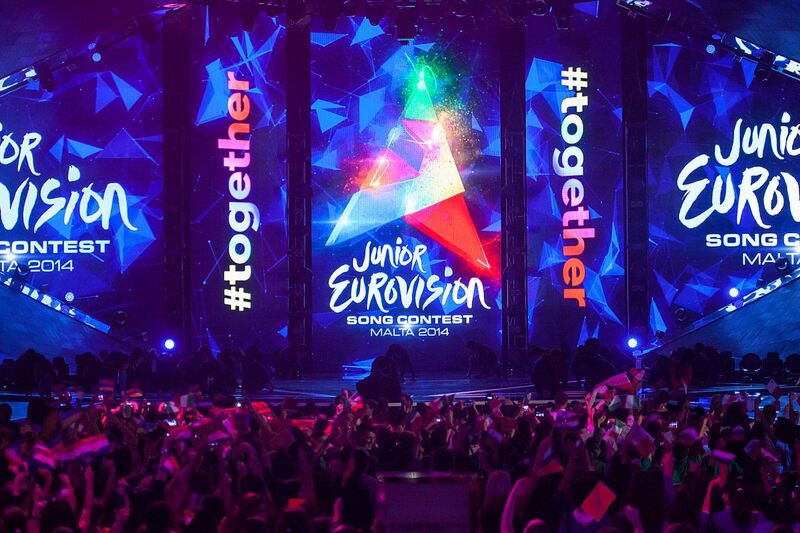 ← All #together now…some quick predictions for JESC 2014! The world’s most overdue JESC wrapup: Grande amore for a grande show! From Ti Si Moja Prva Ljubav to Tu Primo Grande Amore (or from one first love to another) we have our twelfth Junior Eurovision champion! I know this news is so old by now it’s practically growing fungus, but I have had a hectic couple of weeks by the standards of the disorganised sloth that I am – so it’s only now I’ve managed to pull some kind of JESC recap together (or rather, #together…no points for ‘seeing what I did there’). I may as well have waited until Junior Eurovision 2015 happened and then combined this post with a review of that, but being late to every kind of party is more my style. So here I am. Anyway…that aforementioned Junior champ is Naples’ own Vincenzo Cantiello, who beat out fourteen all-girl acts and Bulgaria (some say it was all about Krisia, but I say Hasan and Ibrahim deserve serious credit too) to nab the biggest, shiniest trophy of the three on offer, in a victory that I did not see coming until it…well, came. As someone who saw/heard something special in Italy’s debut entry from the start, but who had convinced herself that it was going to bomb spectacularly, I could not be happier with this result. For the first time in the entirety of Eurovision history, my favourite song as of comp night HAS WON. O to the M to the G.
Obviously, that glorious triumph was my highlight of the November 15th show, but read on for my extremely delayed rundown of everything else that took place in the lead-up to Vincenzo’s victory. 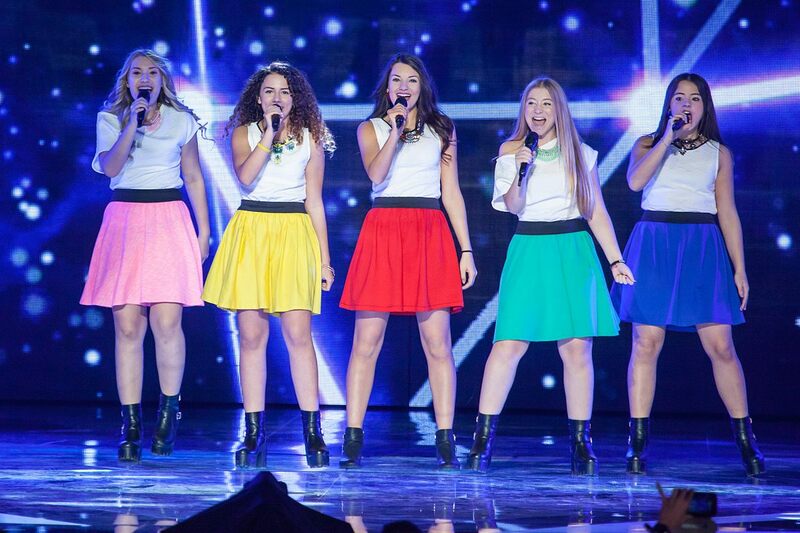 Malta’s first (Junior) ESC: How did they do? Generally speaking, Malta deserves a round of applause (which I am giving them right now. If you listen very carefully you may be able to hear it). Size doesn’t matter when it comes to putting on a jolly good show, as the awesomeness level of the stage and production will attest. I mean, that stage was so high on the sweet-as-o-meter that it was reused for MESC a week later (and it’s the best stage MESC has ever had). Shipbuilding chic at its finest. Hostess-wise…well, save for a dodgy jumpsuit and a visible bra that I’m not sure was entirely appropriate for a children’s song contest, Moira Delia more than fulfilled her presentation duties, proving that having two people at the helm is unnecessary – especially when it results in the kind of painful, scripted banter we got from Zlata and Timur last year. She even managed to keep her composure during that pre-reprise stampede of under-16s, which was definitely not scripted. Extra claps for you, Moira! d) The…ah…well, I guess that was it. 1 point goes to…Sweden – Julia was far from being the best vocalist in show, but as Du Är Inte Ensam makes a better live song than studio one, and I totally dug those glittery outfits (backing dancers’ fringed sleeves included) her time on stage was enjoyable for me. 2 points go to…Slovenia – When Sanna Nielsen’s already trademarked a cage of light, where do you go next? Well, duh…you flick the switch on a cage of pyro! Throw in a simple but effective white and metallic outfit and an impressive vocal range, and you’ve got a solid, if not mind-blowing, debut entry for Slovenia. 3 points go to…San Marino – Based on how horrendous The Peppermints had the potential to be, they pleasantly surprised me. A few of the girls should have left the solos to the stronger singers, and there were some rather unladylike dance moves in the performance, but generally the harmonies were tight and the engagement with the crowd and camera was good. My thumbs are up for those rainbow skirts, too. Just swap the red with the yellow, and I’ll be satisfied. 4 points go to…the Netherlands – You could never accuse them of slacking off in the dance department. Julia had an accomplished posse of movers and shakers behind her as she delivered a confident rendition of Around, sometimes joining in with them without missing a beat. Coming directly after Malta must have been intimidating, but she tried her best to repair the damage from Federica shattering everybody’s glassware with her operatics. 5 points go to…Belarus – Nadezhda was my pre-contest favourite, so I was pretty excited to see her open the show. After a slightly shaky start, she pulled a polished performance out of her hat (a.k.a. her elasticky feather dangler thingy) complete with giant Ruslana-worthy horns, and though it didn’t give me the major feels I was hoping it would, I was struck yet again by Belarus’ knack for producing brilliant JESC entries as opposed to their not-so-brilliant adult entries. If the EBU suddenly decides to bend more than one rule regarding the ESC, can we have Nadezhda for Vienna? 6 points go to…Cyprus – Sophia needed dancers to elevate Pio Omorfi Mera, and possibly a change of stylist. However, she owned that big stage, oozing stage presence, looking like she was having the time of her life, and giving one of the best vocals of the evening. That key change made me love key changes again! To think, once upon a time I was worried she wouldn’t be able to sing this song live. #idiot. 7 points go to…Ukraine – One of the most interesting performances to watch was Sympho-Nick’s, due to their unique entry onto the stage, and the interpretive dance that followed. 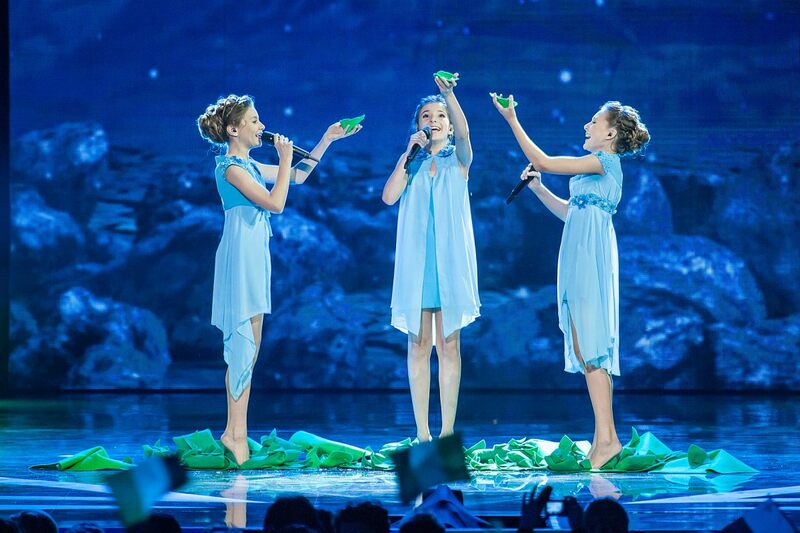 I also commend them for the drastic improvements in their harmonies since the Ukrainian final. The only reminder of that winning-yet-quite-awful performance was the identical outfits (they did…wash those since then, right?). 8 points go to…Armenia – This was JESC all over, and nobody in their right mind could have sat through it and not enjoyed it (so if you didn’t, Google insane asylums in your area STAT). Betty’s almost-studio-perfect vocals made Monika of the Chocolate Factory’s throaty screaming session sound even worse than it actually was. 10 points go to…Bulgaria – After all the bad luck they had during rehearsals (throat afflictions, incomplete run-throughs, electrical faults…Bulgaria experienced it all) Krisia, Hasan and Ibrahim nailed their three minutes when it mattered most, jury final aside. There was nothing about this that wasn’t perfect and magical and filled with rainbows and smiles and unicorns. And I don’t care if she already has loving parents – I am adopting Krisia ASAP because she is PRECIOUS. 12 points go to…Italy – This was the only performance that I can say blew me away. 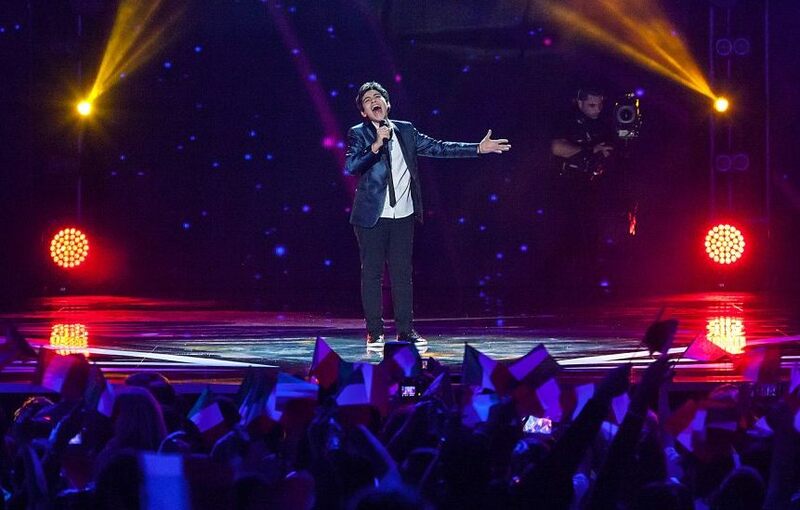 I was on Team Vincenzo from the beginning, but I didn’t think Italy had a hope in heck of JESC success until this kid created a magic moment on stage. Even then I didn’t think he’d win, but I guess good things do come to those who wait (for an eternity in the hope their favourite song will come out on top for once). Vincenzo : JESC champ and record holder for the biggest ‘TA DAAAAAAAAAAAAAAA!!’. Croatia – The glory days of Dino Jelusić and Nika Turković were hard to recall as poor Josie struggled to keep her voice in check. It did turn out to be game over as, despite her best attempts to dance, schmooze the audience and sing at the same time, Croatia pretty much secured themselves the wooden spoon over 180 cringe-worthy seconds. Montenegro – Unfortunately, the fluoro skirt/leather jacket combo wasn’t the only thing Maša and Lejla borrowed from their dreadful preview video for their turn on stage. They also adopted the same air of ‘get both of us out of here PRONTO!’ only this time with 110% more lethargy. I’ve never seen such half-hearted “dance moves” and attempts to get the audience going in my life. Russia – Meh. Yeah, she’s cute, and yeah, she can sing, but Alisa faltered just enough leading up to the final twenty seconds of Dreamer to underwhelm. As someone who disliked this song anyway, she would have had to go above and beyond to impress me. Serbia – Nice vocals from Emilija, but not a lot of personality was injected into her performance. And what was going on with her outfit? I’m all for the monochrome trend, but this girl is 14 and was at Junior Eurovision – she wasn’t a high-powered 45-year-old attending an office meeting. Malta – There’s no doubt about it, Federica’s an incredible talent (even if I still can’t wrap my head around that voice coming out of an eleven-year-old) and I did enjoy her performance. But I was disappointed in one respect, and again, it’s fashion-wise. When your song’s called Diamonds, live a little! Get that Swarovski-brand bedazzler and go crazy. Don’t just wave a roll of beige fabric at a pile of rhinestones and think that’ll cut it. Whew. After far too much performance critiquing, let’s take a look at where those performances got the contestants on the scoreboard. My prediction for each placing is in brackets (like this) and shockingly, I have never predicted a Eurovision event so accurately (which doesn’t say much based on my embarrassing prediction history). But I’ll let you figure out exactly how accurate I was for yourselves, as I don’t like to brag. Well, I do, but I don’t want you all to hate me. Armenia had the most flags, but it’s who has the most points that matters! Italy’s win came pretty convincingly, with one of the higher scores achieved in JESC history and a solid four sets of douze points. Bulgaria also scored four lots of top points, while bronze medalist Armenia received six sets. Vincenzo’s six sets of 10 points, however, helped him leapfrog Betty’s single 10. Georgia, Malta and the Netherlands were the only other countries to get douze points, with one apiece. Poor Croatia! They attracted one measly point in addition to the automatic twelve, which came from San Marino. I’m not surprised, but I feel sorry for Josie nonetheless. Aaaaaaaaaaand I’m done. I think. I’m also done with my JESC “coverage” for this year (cue grumblings of ‘Well jeez, it’s about time!’) so those of you exclusively on Team Senior can rejoice – though I can’t promise I won’t be slipping in the odd Junior-flavoured morsel from time to time pre-Italy (?) 2015. But for the most part, it’s Vienna and Vienna’s NF season that I will FINALLY be focusing on in the coming months. Just like everyone else. Hey, I never said I was groundbreaking! 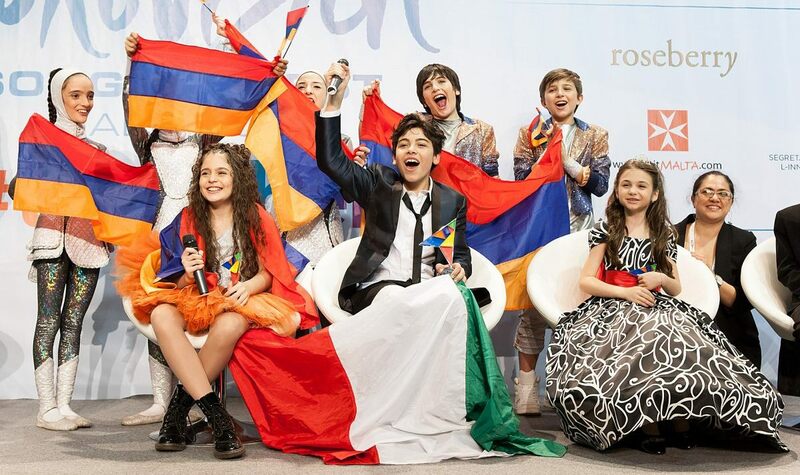 Posted on December 1, 2014, in Junior Eurovision, Reviews and tagged highlights, Italy, JESC 2014, Junior Eurovision, Malta, performances, scoreboard, Vincenzo Cantiello, wrapup. Bookmark the permalink. Leave a comment.